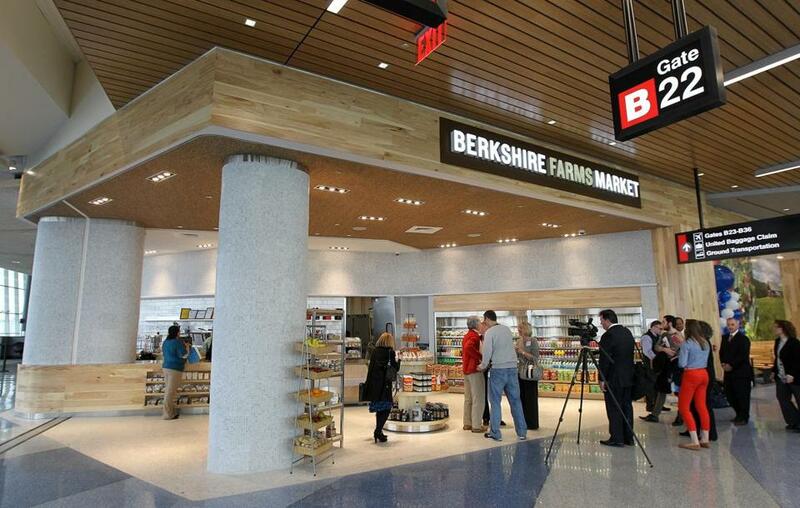 The new Berkshire Farms Market will debut in the refurbished Terminal B at Logan Airport Wednesday. The newly renovated Terminal B at Logan International Airport opens Wednesday, promising United Airlines passengers technology, efficiency, and locally-made products from the Berkshires. The opening culminates an 18-month, $160 million project that has allowed United, which merged with Continental Airlines in 2010, to consolidate operations that were spread between terminals A and C. United will operate 10 gates in Terminal B. The 97,000-square-foot space — about the size of big box superstores — features a ticketing area with 24 self-service kiosks that United says will allow passengers to get their boarding passes and check luggage in a few minutes. Once past security, customers will have a view of the entire tarmac through floor-to-ceiling windows. Yellow and red are splashed throughout the modern space, including chairs and lighting fixtures. Each chair is equipped with its own outlet. Large flat screens allow passengers to use an interactive map to find their way in the terminal. At the gate, passengers will be able to board themselves by scanning their own boarding pass in an almost turnstile fashion. Passengers will have the choice of several restaurants and other vendors, including airport standards such as Peet’s Coffee and Hudson News. Local Boston chain restaurants like Stephanie’s and Legal Seafoods will serve passengers in the terminal. One of the unique offerings of the terminal will be the Berkshire Farms Market, which will sell products made in Western Massachusetts, including granola, syrup, and chocolates. Tastes on the Fly, a restaurant group that owns retail stores and eateries in airports around the country, partnered with the Berkshire Farm & Table, a nonprofit in Sheffield, to create the market. This market is modeled after Taste on the Fly’s Napa Farms Market in San Francisco International Airport, which serves products from the Napa Valley. Governor Deval Patrick said it’s important to have this local market in the international airport because it helps promote the state and the wide variety of products made here. Frank Olito can be reached at frank.olito@globe.com.